After serving the community for over 60 years, Ahousaht's St. Lawrence Catholic Church was torn down on Wednesday. Plans are underway to build a new, non-denominational church at the site (Curt McLeod photo). The iconic little white church, built in the summer of 1956, had fallen into a state of disrepair and was condemned. At one point in time there were two churches in Ahousaht. The older Presbyterian, or blue church, located at the north end of the village, and the Catholic Church near the band office. Back in the late 19th century various missionaries traveled the coast to remote communities in a race to convert Aboriginal people from their forms of spirituality to that of a European-based church. In Clayoquot Sound the Catholics built a church in Hesquiaht and Christie Indian Residential School at Kakawis, near Tofino. They had a church and school in Ahousaht in the mid-1890’s but abandoned it after the District of Indian Affairs refused to contribute funding, according to information from ‘The Children Remembered’ website created by the United Church. The United Church arrived in Ahousaht in the late 1890’s and built a church and residential school with assistance from Indian Affairs. Some Ahousaht families sent their children to the residential school while others sent their children to the Catholic Christie Indian Residential School at Kakawis. Some of the elders recalled the division and rivalry that was fostered because of the two competing churches. But it didn’t last. As they almost always do, the families came together. According to Ahousaht elder Marie Donahue, when the United Church was torn down about 15 years ago people of all faiths began using the Catholic Church for their needs. Donahue is also a member of Ahousaht’s Catholic Women’s League (CWL). She assisted with decision-making on the use of the church property. 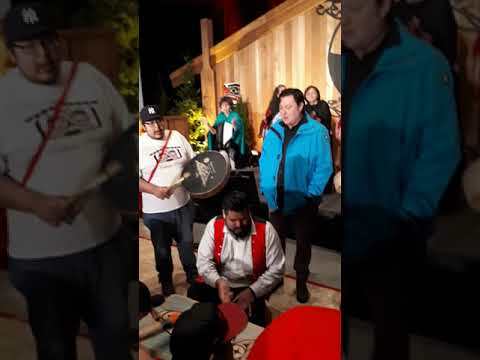 When there is a funeral in Ahousaht, the remains of the loved one would be placed in a church overnight then carried to the hall for the funeral. “Our relatives laid in state in the church, no matter what religion,” she said, adding that they are all family. But the last remaining church was so unstable that they would only allow the bare minimum of pallbearers into the building to assist with the casket. Family and friends were asked to remain outside. Finally, in early February, the decision was made to tear the church down. According to author Margaret Horsfield, when it opened in August 1956, the new St. Lawrence Church boasted a 6.7-metre high steeple. Mr. J. Bohn of Mt. Angel Abbey in Oregon completed all the interior carpentry. He built the altar and pews at Christie Indian Residential School. While some would rather not see any symbols of Christianity in First Nations villages after what went on in church-run Indian residential schools, others have fond memories of events held at the church. Not only was St. Lawrence Church a place for Sunday services, it also was a place where marriages, baptisms and, sadly, funerals took place. In 1973 the little white church on the hill served as the back drop for the opening scenes of the movie, I Heard the Owl Call My Name, filmed in Ahousaht and featuring many Nuu-chah-nulth people. Donahue says the church will be rebuilt thanks to fundraising efforts of the local CWL (Catholic Women’s League). The group has been holding bingos six nights a week for several years and have raised $52,000. Donahue says the land that the church sat on was donated by Ahousaht member Thompson Fatty and will likely be used again for the purpose Fatty intended. At the very least, Donahue hopes they can put a structure there that will provide living quarters for visiting clergy, along with a chapel. The pews and the brass bell, still in good condition, were salvaged and will be stored until a new place of worship is built. The CWL continues to fundraise and hopes to find charitable organizations that will donate to the construction of a nondenominational church that the entire community can use. Dated 1956, the church bell was saved from the demolition (Curt McLeod photo).